from 3 pcs. 8,61 EUR ea. from 10 pcs. 7,53 EUR ea. from 20 pcs. 7,01 EUR ea. from 40 pcs. 6,55 EUR ea. Ask for a rebate from 150 pcs. These rubberised pot magnets with threaded peg work great on delicate surfaces. The rubber coating not only protects from scratches but also increases the weight capacity in shear direction and makes them slip-resistant. Compared to standard pot magnets without a rubber coating, these rubberised pot magnets are thinner and more unobtrusive. There is a steel plate under the rubber coating with 6 embedded magnets. They are arranged alternately with north and south pole facing up. Please note that rubberised pot magnets become rusty when consistently used outdoors. Our ferrite pot magnets, on the other hand, are rust-proof. 1 pc. 13,09 EUR ea. 1 pc. 24,86 EUR ea. 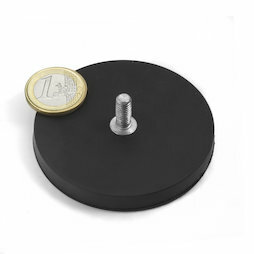 Ø 65 mm, as a counterpart to magnets, not a magnet!